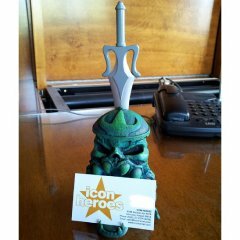 I’ve been a fan of Pat and the work he’s done over at Icon Heroes ever since the first Thundercats Staticon came out. Now it looks like they are moving into another direction with a different property from my childhood and I couldn’t be happier. They have just announced that they will be releasing a Masters of The Universe Castle Greyskull Business Card Holder. It gets even better… because they are also putting out He-Man’s Sword as a letter opener. Finally, an excuse to have He-Man Toys on the desk at work! Now they just need to make a bigger one that is in line with the amazing Cat’s Lair that they produced and I’ll be one of the happiest collectors in the world. Display your business cards in this highly detailed replica of the Castle Grayskull entrance complete with movable Jawbridge! Painted by The Four Horsemen, no detail was overlooked from the beautiful Coat of Arms crest on the Jawbridge to the menacing skull facade. Lower the Jawbridge to display business cards on the lower teeth. The Castle Grayskull Business Card Holder also stores the He-Man Power Sword Letter Opener (sold separately).